This is a really simple tutorial on how to uncap the Framerate in the NDS Pokémon Games. The tutorial that actually inspired me bring the method over here was this one, posted in the community Pokémon Trash. 1) Open NSMB Editor and your ROM on it. After a second, you'll see this window. 2) Go to the Tools/Options tab and click on the button that says "Decompress ARM9 Binary". 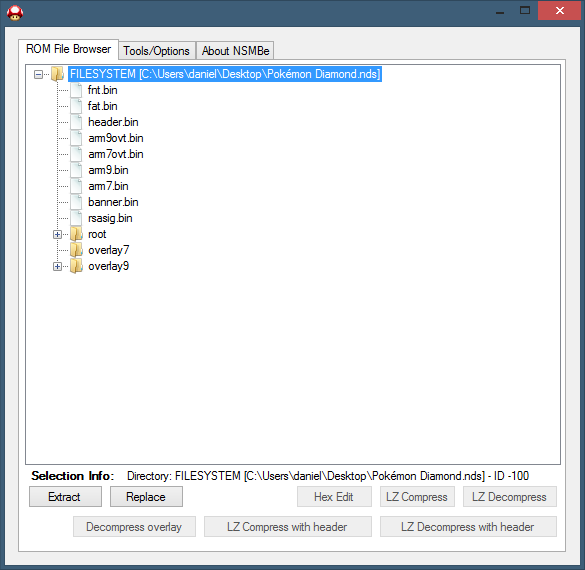 3) Go back to the ROM File Browser tab, select the arm9.bin file and click on the "Extract" button. Save the file wherever you want. 4) Open the arm9.bin file that you just saved with a Hex Editor and go to this offset depending on the game you're modifying. 5) Once there, replace "25 63" with "00 00" and save. 6) Go back to NSMB Editor, select the arm9.bin file and click on the "Replace" button. 7) Choose your modified arm9.bin file, wait a second or two and that's it. 2) Once there, replace "25 63" with "00 00" and save. Note: The offset may vary depending on your dump of the game. In which case, if none of the offsets above do have the bytes 25 63, I suggest you to search from the beginning of the ROM "25 63" and go one-by-one changing the bytes to 00 00 and testing until you hit the jackpot. Here's a really small video showing how Pokémon Platinum works with and without uncapping the framerate.